President Maithripala Sirisena has stepped into break a deadlock in constitutional negotiations, holding a round of tripartite talks with the United National Party (UNP), the Tamil National Alliance (TNA) and his own Sri Lanka Freedom Party (SLFP) late last month. Prime Minister Ranil Wickremesinghe attended the tripartite discussions, together with UNP Chairman Malik Samarawickrema and Party General Secretary Kabir Hashim. TNA Leader R. Sampanthan attended with TNA Parliamentarian M.A. Sumanthiran. President Sirisena chaired the meeting, with SLFP Ministers Susil Premajayantha, Faizer Mustapha and Nimal Siripala De Silva also present. Daily FT learns that JVP Leader Anura Kumara Dissanayake was also invited to attend the talks but had been unable to participate due to other commitments. The meeting took place on 30 January, subsequent to discussions between President Sirisena and the TNA about ongoing consultations on the new constitution. At the meeting, President Sirisena told representatives from the two main parties and the TNA that a new constitution and transitional justice was the “heavy baggage” the Government had to carry, Daily FT reliably learns. There was no question of either of these commitments not being delivered on, the President told the meeting. “My impression is that both the President and the Prime Minister are committed to a genuine constitutional process,” Opposition Leader R. Sampanthan told Daily FT.
Sampanthan, who leads the TNA that is negotiating on behalf of the Tamil people on power sharing arrangements for the north and east, emphasised that it was necessary to build a “substantial consensus” that could be approved by Parliament and the people at a referendum. The fundamental reason for the failure of Sri Lanka’s last two republican constitutions, was the fact that they were not built on consensus, even between the two major political parties, let alone the representatives of the Tamil people, the TNA Leader explained. The 21-member Steering Committee tasked with drafting the new constitution hit major roadblocks at the beginning of this year, with the SLFP and the JVP requesting more time to study the proposals in the Interim Report, and provide inputs. The Steering Committee initially hoped to present its interim report to the Constitutional Assembly of 225 members of parliament by November 2016. Interim proposals to be submitted to the Constitutional Assembly were circulated among the membership of the Steering Committee since November 2016, the Opposition Leader said. After the interim report had been in circulation for several weeks, some members of the Steering Committee had expressed the view that they needed more time to study the proposals and make comments. “Consequently it was not possible to bring those proposals before the constitutional assembly,” Sampanthan said. “The delay in movement on the new constitution has been caused by this factor,” he added. Following the first round of tripartite talks, legal experts have been tasked with drafting a new, narrowed-down document, encompassing Steering Committee interim proposals already on the table, as a way to break the deadlock in negotiations, authoritative sources told Daily FT. The process is being coordinated by senior constitutional lawyer Dr. Jayampathy Wickramaratne. The fundamental sticking points in the ongoing negotiations relate to the structure of the state and power-sharing, the merger of the North-East and the question of affording primacy to one religion, Daily FT learns. Prime Minister Wickremesinghe has also convened a meeting of the Steering Committee on 21 February, Daily FT learns. Co-Convenor of the civil society movement Purawesi Balaya and academic Gamini Viyangoda told Daily FT that President Sirisena had confirmed the meeting of the three political parties had taken place, during a discussion with civil society representatives on 9 February. “The President said he was having talks with the UNP and the TNA to get consensus and come to an understanding on the constitution,” Viyangoda said. 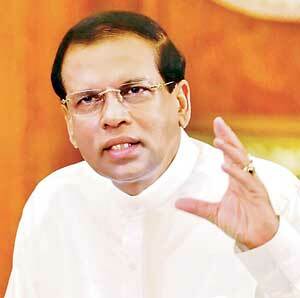 President Sirisena emphasised that the constitution would take priority, he added. “On principle, President Sirisena agrees that a new constitution must be put before the people to get their opinion on the document,” Viyangoda said in an interview. According to Viyangoda, at meetings with civil society representatives on several occasions President Sirisena had categorically ruled out contesting the presidency in 2020. “Members of his party are making statements claiming he will be a candidate at the next election to counter growing speculation that an outsider might be fielded as the SLFP’s presidential hopeful in 2020,” he explained.